Can't wait for the photos of your room and the cards too! This one is wonderful! Fab idea using the fun ribbon! OMGosh! 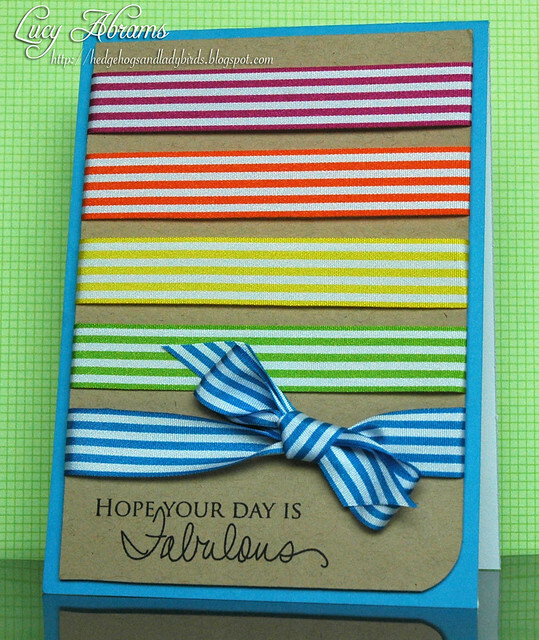 What a fabulous card with the yummy colors of ribbon! WOW! Fabulous ribbon - and I love your card! So pretty. Such a nice idea: ribbon (-: How wonderful and the colors, so pretty. Thanks for the inspiration!! It's stunning Lucy and such a wonderful idea, your cards are so inpsirational! Looking forward to seeing your new craft space Lucy. This is a great card, love your use of the ribbon. Looking forward to seeing photos of your room...and this card makes me happy...so bright and cheery! Absolutely fabulous!!!! LOVE THIS!!! Can't wait to see pics of the craft room! Great use of ribbon. Super card. I love to see pictures of your new craftroom. SO fun, Lucy! Love those ribbons! How cheery! Can't wait to see pics of your new craft space. How fun! Yummy card Lucy. Would really love to see the photos of your craft space. wow, this is fun !! great card ! Looking forward to seeing pics of your craft room--I'll bet it's awesome! Love your card, and belated Happy Birthday to you! Hugs! Spectacular and amazing! Great CAS design. I am so in awe of a new crafty studio :) A gorgeous card - love all the ribbon! Oh, this is sweet! Can't wait to see your new space! What a fun mixture of sweet rainbow colors! Looking forward to seeing your new crafty space! Absolutely gorgeous. Going into my VisualizeUs list. OH I love love love this! I love ribbon! This is just perfect! Great idea! I have been turning around a similar idea in my head after buying some matching ribbon. Seeing your card, now I will actually make my card. Thank you for sharing! I recently discovered your blog and just love your cards! Ohhhhhhhhhh - I just cannot wait to see your new room. Love viewing where other artists create their magic ... and you sure do a lot of that! What a fun card! Love that fantastic ribbon - especially the way you used it! such a cool design, Lucy! love it!